Dozer is a lazy, bear villager from the Animal Crossing series, seen only in Animal Crossing and Doubutsu no Mori e+. As his name suggests, he always seems to talk about dozing, or sleeping, making him sound lazy. His initial phrase is "zzzzzz", which also makes him sound lazy. Dozer is a purple bear that initially wears the Bear Shirt, which can be compared to that of a gummy bear. He has a curly black unibrow, and a brown muzzle with a shiny black nose. His eyes are almost always closed as if he's sleeping, hence the name "Dozer". Dozer has a lazy personality, meaning he will mostly talk about food. He will enjoy eating and sleeping, and won't get along with snooty or jock villagers due to the fact that Dozer does not really care about his weight or his physical appearance. He will get along with normal villagers. Dozer's fond of saying that one shouldn't hurry through life. His theory is that good things come to those wait. Then again, every time opportunity knocks, Dozer's in a deep sleep. Bummer. The official Prima Games Guide to Animal Crossing: New Leaf lists Dozer as appearing in the game. It states his birthday as being August 16, which is actually Nate's birthday. Nate is also a lazy bear villager. Dozer is the only bear to not make an appearance in Animal Crossing: New Leaf - Welcome amiibo. 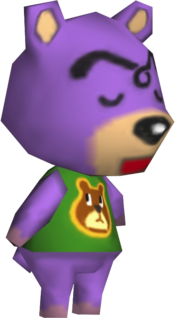 In a character popularity poll held on the Japanese Animal Crossing website, Dozer ranks as the 233rd most popular character at 64 votes, tied between Belle and Cyrano, and ranking below Paolo.